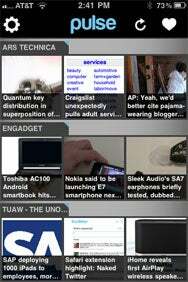 Like its big brother Pulse News Reader for iPad, Pulse News Mini for the iPhone is built for image-heavy news browsing. A Look at the Latest News: Like the iPad version of Pulse, Pulse News Mini for the iPhone and iPod touch gives your RSS feeds a magazine-style look. The more image-centric your feeds, the better. Pulse News Mini has essentially the same pluses and faults as the iPad version. The app from Alphonso Labs aims to present a magazine-style layout for your feeds, showing thumbnails based on images within those articles whenever possible. You scroll through your list of feeds vertically, and swipe sideways to find more stories within a given feed. If you only subscribe to a few feeds, Pulse works well. If you’re an RSS junkie like me, with well over 200 subscriptions, Pulse’s long-list approach doesn’t scale quite as well. When I plugged in a handful of my favorite feeds, Pulse was easy to navigate, but the app is geared toward casually scanning for headlines that captivate you. Feeds that lack images are a little tougher to browse; all those tiny tiles with headlines look nearly identical, which is unfortunate. The $2 app tucks in a few advanced features—Instapaper support, Google Reader syncing, and posting to Facebook and Twitter. I could see using Pulse to check in on blogs that you read only intermittently, particularly if they tend to be more visually-focused. For my purposes, though, it’s not usable as a full-featured tool to navigate many feeds.